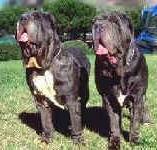 This section is about Italian breeds of dogs, to which Federico Vinattieri, an expert breeder of Neapolitan Mastiff and a student at Pisa University for Veterinary Science, has collaborated. The translations have been supervised by Franca Gordiano. If you click on the icon to the left you can look up a picture file about each breed: its origin, classification, historical data, general aspect, temperament and standard. As well as the 14 autochthonous recognized breeds and the Maremma Scenthound (the Standard has been approved with resolution ENCI n° 192/2003), some ancient breeds, which have not been recognized though, are also mentioned. All over the world the dog is the most appreciated domestic animal that from time immemorial, man has kept as companion, for hunting, working, guarding, as shepherd dog, draught dog, war and health service. All autochthonous Italian breeds are very ancient: each bears fascinating and interesting features regarding morphology as well as natural attitudes and temperament. The Corso dog is the lineal descendant of the ancient Roman Molossian, or the Neapolitan Mastiff, a real “living monument” among the present-day dog experts, related to the large Assyrian-Babylonian Molossian, then spread all over Europe thanks to the Roman “Campaigns”. The National Italian Canine Organization (ENCI), recognized by the Italian State, was founded in 1822 and deals with the improvement and promotion of Italian dog breeds either in Italy or abroad.